In mathematics, an autonomous system or autonomous differential equation is a system of ordinary differential equations which does not explicitly depend on the independent variable. When the variable is the time, they are also named Time-invariant system. A time-invariant (TIV) system is one whose output does not depend explicitly on time. Blanchard, P., Devaney, R. L., & Hall, G. R. (2005). Differential Equations (3rd ed.). Brooks Cole. This property can be satisfied if the transfer function of the system is not a function of time except expressed by the input and output. An autonomous differential equation is one where there is no explicit occurrence of the independent variable. Many laws in physics, where the independent variable is usually assumed to be time, are expressed as autonomous systems because it is assumed the laws of nature which hold now are identical to those for any point in the past or future. Autonomous systems are closely related to dynamical systems. Any autonomous system can be transformed into a dynamical system and, using very weak assumptions, a dynamical system can be transformed into an autonomous system. A linear differential equation is any differential equation that can be written in the following form. The important thing to note about linear differential equations is that there are no products of the function,, and its derivatives and neither the function or its derivatives occur to any power other than the first power. The coefficients and can be zero or non-zero functions, constant or non-constant functions, linear or non-linear functions. Only the function,, and its derivatives are used in determining if a differential equation is linear. Homogeneous: A differential equation is homogeneous if every single term contains the dependent variables or their derivatives. where M and N are also homogeneous. where are all constants and . Laplace transform cannot be used to solve nonlinear differential equation easily. when s->0 the bounds of result is limited and approaches Ya, will have the same result for any input because H(s)=Y(s)/X(s). the system has an attractor or sink equilibrium point Ya in phase plane or slope plane at that value when x->infinity. which means the system has a stable steady state. State variable method is a fundamental method because it relies on the diff equations. It deals with first order diffs . A state space representation is a mathematical model of a system with memory as a set of input, output and state variables related by first-order differential equations. To abstract from the number of inputs, outputs and states, the variables are expressed as vectors. State is a variable for which we have a first order differential equation. The internal state variables are the smallest possible subset of system variables that can represent the entire state of the system at any given time. The minimum number of state variables required to represent a given system, , is usually equal to the order of the system’s defining differential equation. If the system is represented in transfer function form, the minimum number of state variables is equal to the order of the transfer function’s denominator after it has been reduced to a proper fraction. It is important to understand that converting a state space realization to a transfer function form may lose some internal information about the system, and may provide a description of a system which is stable, when the state-space realization is unstable at certain points. In electric circuits, the number of state variables is often, though not always, the same as the number of energy storage elements in the circuit such as capacitors and inductors. The state variables defined must be linearly independent; no state variable can be written as a linear combination of the other state variables or the system will not be able to be solved. Amir: so the number of independent memories determine the number of state variables. and Omega [rad/s] is the undamped resonance frequency. The step response is the integral (w.r.t time) of the impulse response. The transfer function is the Laplace transform of the impulse response. If a system is represented by a single nth order differential equation, it is easy to represent it in transfer function form. Starting with a third order differential equation with x(t) as input and y(t) as output. To find the transfer function, first take the Laplace Transform of the differential equation (with zero initial conditions). Recall that differentiation in the time domain is equivalent to multiplication by “s” in the Laplace domain. The transfer function is then the ratio of output to input and is often called H(s). Oppenheim, A. V., Willsky, A. S., & Hamid, with S. (1996). Signals and Systems (2nd ed.). Prentice Hall. A system is causal if the output at anytime depends on values of the input at only the present and the past. All memoryless systems are causal. However, causality is not often essential in applications in which the independent variable is not time. be\ it depends on x at t and is not anticipating x in future. A stable system is one in which small inputs lead to responses that do not diverge. Stability of physical systems generally results from the presence of mechanisms that dissipate energy. If we suppose a system is unstable, then a useful strategy to verify this is to look for a specific bounded input that leads to an unbounded output. As shown before, without specifying the ROC, this could be the Laplace transform of one of the two possible time signals . Feedback can be used to stabilize a non-stable system or destabilize a stable system. Amir what is the reason for the stability of social systems? The energy dissipation in stable physical system is because of the fields that are binding the particles. In Social systems we have to search for the bonds between social actors. Amir: Social system are continuous time systems with memory. This memory has been limited and short lived. ICT may increase the capacity and longevity of this memory. This means the response to false stimuli will be slower. This resistance to false stimuli comes from the possibility of compare with past. The individuation reduces this memory. Social system are time variant but their change over time is slow. I want to hypothesize that many social systems can be considered time invariant. But they are not linear. may be just because of something like c mentioned above. So they are only incrementally linear? The fundamental result in LTI system theory is that any LTI system can be characterized entirely by a single function called the system’s impulse response. The output of the system is simply the convolution of the input to the system with the system’s impulse response. This method of analysis is often called the time domain point-of-view. The same result is true of discrete-time linear shift-invariant systems in which signals are discrete-time samples, and convolution is defined on sequences. 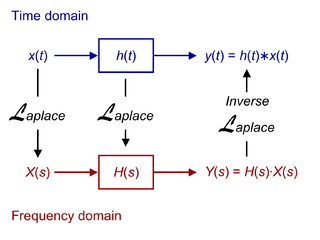 Equivalently, any LTI system can be characterized in the frequency domain by the system’s transfer function, which is the Laplace transform of the system’s impulse response (or Z transform in the case of discrete-time systems). As a result of the properties of these transforms, the output of the system in the frequency domain is the product of the transfer function and the transform of the input. In other words, convolution in the time domain is equivalent to multiplication in the frequency domain. For all LTI systems, the eigenfunctions, and the basis functions of the transforms, are complexexponentials. This is, if the input to a system is the complex waveform for some complex amplitude and complex frequency , the output will be some complex constant times the input, say for some new complex amplitude . The ratio is the transfer function at frequency . Because sinusoids are a sum of complex exponentials with complex-conjugate frequencies, if the input to the system is a sinusoid, then the output of the system will also be a sinusoid, perhaps with a different amplitude and a different phase, but always with the same frequency. LTI systems cannot produce frequency components that are not in the input. LTI system theory is good at describing many important systems. Most LTI systems are considered “easy” to analyze, at least compared to the time-varying and/or nonlinear case. Any system that can be modeled as a linear homogeneous differential equation with constant coefficients is an LTI system. Examples of such systems are electrical circuits made up of resistors, inductors, and capacitors (RLC circuits). Ideal spring–mass–damper systems are also LTI systems, and are mathematically equivalent to RLC circuits. In signal processing, this definition can be used to evaluate the Z-transform of the unit impulse response of a discrete-time causal system. An important example of the unilateral Z-transform is the probability-generating function, where the component is the probability that a discrete random variable takes the value , and the function is usually written as , in terms of . The properties of Z-transforms (below) have useful interpretations in the context of probability theory. The stability of a system can also be determined by knowing the ROC alone. If the ROC contains the unit circle (i.e., ) then the system is stable. In the above systems the causal system (Example 2) is stable because contains the unit circle. If you need stability then the ROC must contain the unit circle. If you need a causal system then the ROC must contain infinity and the system function will be a right-sided sequence. If you need an anticausal system then the ROC must contain the origin and the system function will be a left-sided sequence. If you need both, stability and causality, all the poles of the system function must be inside the unit circle. from z to Laplace. Through the bilinear transformation, the complex s-plane (of the Laplace transform) is mapped to the complex z-plane (of the z-transform). While this mapping is (necessarily) nonlinear, it is useful in that it maps the entire axis of the s-plane onto the unit circle in the z-plane. As such, the Fourier transform (which is the Laplace transform evaluated on the axis) becomes the discrete-time Fourier transform. This assumes that the Fourier transform exists; i.e., that the axis is in the region of convergence of the Laplace transform.